Let's talk about Hydrogen Peroxide for a few minutes - especially how it relates to your teeth and general dental care. 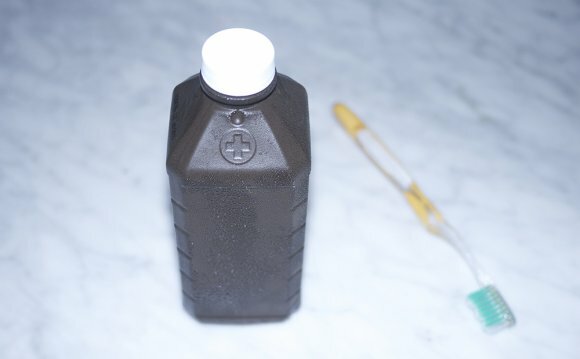 To start, Hydrogen Peroxide is a fairly common product, and has been used by people for years as a disinfectant/antiseptic, especially in the case of cuts and small wounds. Chemically, you might be surprised that Hydrogen Peroxide is fairly close to water. In fact, it's simply water with an extra oxygen molecule (water is H2O, Hydrogen Peroxide is H2O2). This doesn't mean you should drink it, of course, but it's interesting nonetheless. An interesting fact about Hydrogen Peroxide is: is it universally sold in brown bottles. Why? Because light is the enemy of Hydrogen Peroxide, and continued exposure to light will slowly turn it into plain water. Thus, the brown bottles are used to keep light at bay. But even that won't help keep the product fresh indefinitely. Hydrogen Peroxide is fairly unstable, meaning it will degenerate no matter what. So keeping bottles around for years will definitely lessen the effectiveness of the product. You can increase the time you keep it by refrigerating it, but depending on how much fridge space you have, I'm not sure how practical that is (especially since it's so inexpensive). But this concentration comes with a price for some people - there are certain side effects that will affect some (but not all) users. The main side effects are tooth sensitivity and/or gum irritation. These side effects seem to be more common in people who already have some degree of sensitivity, so if you find yourself returning from a dental cleaning with sensitive teeth, you may want to rethink using whitening strips or the like. But if you experience no side effects, then using Hydrogen Peroxide (in moderation) to help whiten teeth is probably OK.
Knowing that Hydrogen Peroxide degrades naturally is a very important point I am focusing on in this blog post. If it degrades naturally from light, heat and age then what's to say that the whitening strips, whitening gels and various over-the-counter whitening products we have to choose from are fresh? If the degeneration is a gradual process, wouldn't freshly made whitening gels/strips actually be more potent than those that have been shipped in a tractor trailer on a 100 degree sunny day, and then sat on a store shelf for 24 months? You bet they would. This brings me to my point: "stabilized Hydrogen Peroxide." The problem with number one is that the preservatives prevent the Hydrogen Peroxide from "disassociating" which is something we actually want when we put it on the teeth. This may save the Hydrogen Peroxide from breaking down while it's on the shelf, but it also prevents it from breaking down when you want it to. Refrigeration is a great method. If Hydrogen Peroxide is immediately refrigerated after being made, it can maintain its potency over quite a long period. And, once it's removed from refrigeration and used on the teeth, it will completely disassociate and provide a very effective bleaching of the tooth enamel. I have not seen this in an OTC product (yet), however we do use systems that utilize this refrigeration methodology clinically, and they are very effective. Complete encapsulation is the most practical method. By encapsulating Hydrogen Peroxide in a vacuum sealed ampoule, you can prevent degradation as well. A good analogy here is soda. The carbonation in a soda can really wants to escape, but since it's in a sealed system (such as a can), it is unable to leak out. Many of the OTC systems use a very weakly sealed packaging system that is not immune to this degradation process like an ampoule is. I hope this post gave you a little more insight into H2O2, and how it can be used in tooth whitening.